Now, a couple quick things and we'll get going. Allow me to address a question I saw go across twitter quite a bit... Jen, a Mormon (I've confirmed this since it first was questioned), was able to play blackjack without compromising her beliefs because there was no actual gambling involved. Without betting, it's just a card game, no more "sinful" than old maid or go fish. Next, I was caught off-guard that Gretel-Ann's voice was rather hoarse in the finale... was I the only one to notice? And, finally, I thought it was intriguing that Gretel-Ann had such a low percentage of the "twitter votes" that Buddy was addressing on most commercial breaks. Even after Jen was gone, she still managed to have a much larger proportion of the votes than Gretel-Ann! 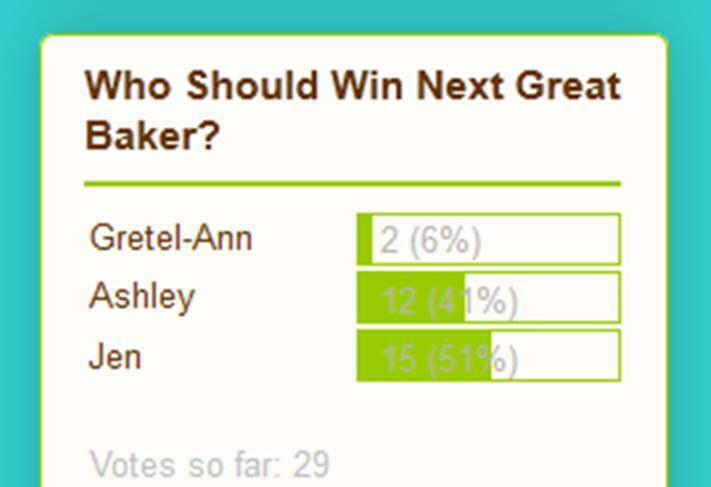 Similarly, our voters hardly rooted for Gretel-Ann, slightly preferring Jen to Ashley. The group then discussed the various "curve balls" that were thrown throughout the competition, like Ashley having to "work with anyone" meaning Paul's team, the deadline changing with the superhero cake, the brides changing their minds mid-cake, having to re-make destroyed cakes, and having to pipe in a freezer. Then, we see more behind-the-scenes thoughts. We learn that if James hadn't dropped out, it would have been Jen going home that round. [Speaking of James, the surgery went well and he's recovering.] Letty never thought Jen would make it to the end, and Buddy sees her as a cake decorator, not a baker. Buddy says that the cast really considers Paul to be the villain, as he rubbed people the wrong way and stepped on everyone's toes, but Buddy felt Paul was just misunderstood. Paul, however, saw Ashley as his nemesis, noting that "she's Skeletor; I'm He-Man." [haha, 80s!] Ashley thought Chad would be in the finale, and many thought he would be the baker to beat. [myself included!] Buddy even noted that Gretel-Ann was "always playing all the angles," though Jen found her "more cutthroat than I realized," and Ashley "never trusted" her. On to the selling! Jen was hoping that this would be her chance to prove that she is more than just a cake decorator, and Ashley was initially afraid that she doesn't have as much to sell as the other two. [quick rundown - customers pay with tickets, and cookies/pastries are 2 tickets each, whole pies/cakes are 10 tickets each. I loved that the "street performers" bought items, too! and, if you saw the tweet, I wondered how much placement would affect this - Jen was in the middle, but the first customers came from the side where Ashley was.] In the end, Ashley was ahead by several hundred tickets, and Gretel-Ann beat Jen by 24 tickets. [just a dozen cookies!] Jen takes her "little ride" on a gondola instead of in a van. Onward to The Elimination Challenge, which starts at 2am when Buddy takes Gretel-Ann and Ashley on a limo ride to a wedding chapel. Then, they get in a pink convertible with an Elvis impersonator and some showgirls. They toast with champagne, dance, and then get right back to the kitchen to show off their inspiration. The task? Take eight hours to create a Las Vegas showstopper cake. Go big, go personal, or go home. [half an hour is a long time to plan!] Buddy's mother and Joey Fatone will be the guest judges. 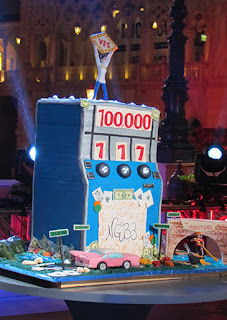 But, before they get to work, they select helpers from the other former contestants, plus some Carlo's Bakery veterans. Ashley picks Ralph, Gretel-Ann goes Mauro, Ashley chooses Frankie, Gretel-Ann selects Tyne, Ashley wants Chad, Gretel-Ann grabs Chris, Ashley takes Jess, and James joins Gretel-Ann. [at this point I was wondering how the show would use thirty minutes to judge, but it started to come together.] Buddy has all of the former opponents vote, which worries Gretel-Ann as she "didn't make friends." [hahahaha!] But, before everyone shows their allegiances, a few bakers ask questions. Letty asks Gretel-Ann if she's learned how to effectively communicate with others and be a true team player, to which Gretel-Ann says that she knows she needs to be more open to personalities with which she struggles, as she panicked in the early episodes because she was intimidated. [reasonable response.] Paul asks Ashley how a 25-year-old has the life experience to become "the next great baker." Ashley disrespects Paul, saying he's arrogant and that he doesn't know her, not even really answering the question. [I have the opposite view on this from Paul, actually. I think that someone on the younger end of the workforce has a better shot at becoming the NEXT great baker... sure, you can pick up hobbies in your nineties, but if you're going to follow someone specific, being younger than them won't hurt. on that note, Buddy is 35...] Well, Emme, Paul, Jen, and Chad go Gretel-Ann, but everyone else goes with Ashley. Chad was originally going to vote for Ashley before hearing Gretel-Ann speak. [interesting.] Jen says that there was more passion from Gretel-Ann. Let me end with a couple thoughts from the commercial breaks - I found it interesting that Grace wanted Jen to make it to the final two. And, Buddy surprising Ashley with a cake in the face was hilarious! much better than the onslaught of frosting that came her way on her first day at Carlo's! Well, what did you think? How would you defend Gretel-Ann's actions? Who would you have chosen for your team? Do you think Ashley will fit in well at Carlo's? I was dying to see Buddy call out Gretel-Ann as a cheater and advance Jen. Jen was the only contestant left with class. Ashley is a potty mouth that can't control her temper. Although I thought it was interesting that Buddy's family was so turned off by the language because his sister's are kinda loud mouths as well so everyone should be use to it. Jen should have been in the finals. Ashley was my choice to win, but Greta-Ann was a cheater and didn't deserve to be a finalist She can boohoo all she wants, but if she couldn't win on an even playing field and leaving the other contestant without enough pans to cook what they needed she showed her true colors as a person right then and there. No wonder her business at home was failing. 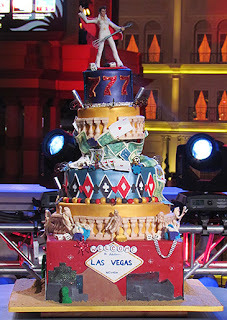 Sorry Jen...You did deserve to be in top 2, Your baking skills were so much better than Greta - Ann's. 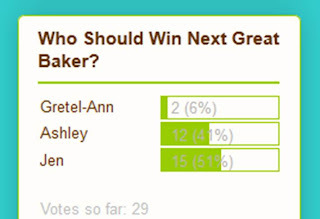 I agree, Jen and Ashley should have been the last two in the finale; as for Greta-Ann, she disgusts me. She boasts how hard up she was and how right she was to take the steps she took in order to win. She showed no regret, so if her children and husband feel ashamed of her, it's her own selfish undoing. It's no wonder her business had already been failing before she showed how she makes her own rules up as she goes along, not caring who she steps on.